Working in the trading card industry is a lot of fun, but make no mistake, it is also a lot of work. The Upper Deck teams in Carlsbad, California and Morrisville, North Carolina are passionate about bringing our world-wide fans the most innovative and highest quality collectibles in the industry. The team has persevered through a lot as of late and managed to put out some extremely compelling products that most fans really love. As a thank you for the team’s hard work and loyalty, Upper Deck’s founder and CEO Richard McWilliam issued two special employee cards today to the team. The first card (EC-1) features rookie sensation and Heisman Trophy winner Cam Newton along with a memorabilia swatch from a jersey worn by Cam. The second card (EC-2) features soccer superstar and Upper Deck spokesman Landon Donovan along with a memorabilia swatch from a jersey worn by Landon during a game. These premium cards are limited and will only be awarded to current Upper Deck employees. Upper Deck's founder and CEO Richard McWilliam gifted employees with two special cards today. It is with great appreciation and gratitude that I present you with this year’s special employee card collectible. Upper Deck always has partnered with the best athletes in the sports world past and present. 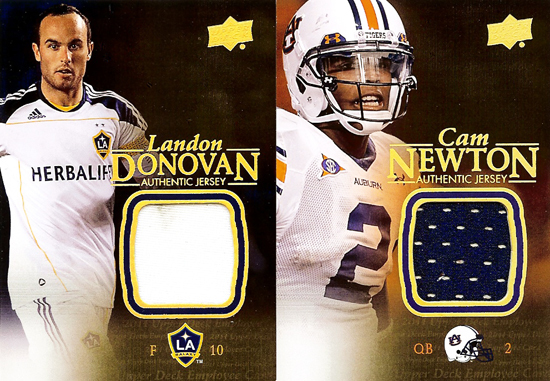 I am proud to present to you this memorabilia card featuring (Cam Newton/Landon Donovan). It is through all your efforts that Upper Deck continues to grow and maintain its industry leadership position. Now Upper Deck employees are struck with a tough proposition; to keep the cards or to sell them. These are the only items from Upper Deck that staff are allowed to sell. For me, I’ll be holding on to these though. They are a great reminder of the hard work we’ve put forth here to continue to be an industry leader and a keepsake I will always cherish. Plus, I’ve worked hard for these! Sweet cards Chris! Great work! You guys deserve em! Congrats Chris you deserve it. I can only imagine some of the stuff you and your staff have to put up with. Keep up the great work!